Hide windows and programs and manage your windows desktop easily with clutterbuddy.This is a free tool to remove the clutter on windows desktop by letting you hide windows or any application. clutterbuddy is a very cool windows desktop management tool.You can manipulate any window or its children. You could not only hide windows and programs including browser windows, but you could also maximize or minimize any window or set any window to stay on top. Clutterbuddy is not only a very useful tool to remove clutter from your windows desktop, but it is also useful to hide those secret windows/programs from your inquisitive peers or boss.Free download clutterbuddy and hide windows or programs easily. 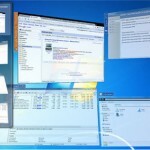 You can also find out how to change windows desktop into 360 degree wide desktop.